The King Baboon Tarantula is a bad tempered spider... letting anyone and everyone know it! The King Baboon Spider Citharischius crawshayi (Pelinobius muticus) will rear up with its fangs ready at the slightest disturbance or perceived threat. It could be said that they are not so much aggressive, but more on the defensive side. But either way, they are highly aggressive and not suitable for beginners. At one time, the King Baboon Spider was the most sought after species for collectors. They are red to bright brown in color, and a female can reach a leg span of up to 7.8 inches (20 cm). Their velvety terra cotta-colored hair and incredible display behaviors make them popular among collectors. The King Baboon Tarantulas are very active spiders at night, with an amazing burrowing behavior. During the day they stay hidden and sealed in their burrow. Then at night they emerge to search for prey and begin to excavate. They are constantly enlarging their burrow and forming new ones throughout the substrate. They were first collected in Kenya in 1899. Like most baboon spiders, the King Baboon Spiders are very aggressive and can be considered a potentially dangerous species. Despite its incredibly aggressive nature though, it has become a staple in the hobby and captive-produced spiderlings are occasionally available. Habitat: Distribution/BackgroundThe King Baboon Spider Citharischius crawshayi was described by Pocock in 1900, while Pelinobius muticus was described by Karsch in 1885. These are the second largest of the African spiders,and are found in Kenya and Tanzania. 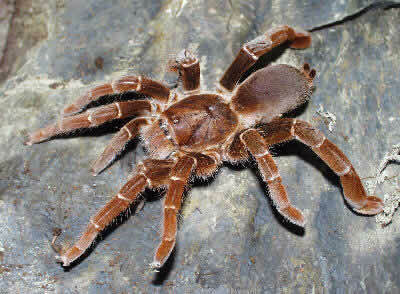 Other common names they are known by are King Baboon Tarantula. Some experts are suggesting that the scientific name for this species should be Pelinobius muticus, based on the idea that Citharischius is a junior synonym of Pelinobius. "The eumenophorine genus Pelinobius Karsch, 1885 is revalidated and proposed as a senior synonym of Citharischius Pocock, 1900... Citharischius crawshayi Pocock, 1900... are treated as junior synonyms of Pelinobius muticus Karsch, 1885....", author R. C. Gallon in his paper "A new Pterinochilus species from South Africa (Araneae, Theraphosidae, Harpactirinae)", 2011. See references below. StatusThe Citharischius crawshayi (Pelinobius muticus) are not on the IUCN Red List for Endangered Species. Description The King Baboon Spider is a large tarantula that is covered over its entire body with a velvety burnt orange coloration. It has enlarged back legs as do most of its baboon spider relatives. It also has large black shiny fangs and is not afraid to use them. They average about 5.5 - 6" (14 - 15 cm), though a mature female may exceed 7.8" (20 cm). Mature males are smaller than females. Males are very hairy and slender and have no tibial hooks to aid in breeding. Food and FeedingThere is a tendency by keepers to feed their large, aggressive species lots of live mice. We suggest feeding the King Baboon Spider a diverse diet consisting of adult crickets, grasshoppers, Tenebrio larvae, and only occasional feedings (once or twice a month) of mice. This variety more closely mirrors the diet of this tarantula in nature and will keep them healthy. HousingIn nature the King Baboon Spider is found in deep burrows associated with rock piles or the bases of trees. In captivity they should be kept in a 15 to 20-gallon terrarium with a secure lid. This enclosure should have a deep substrate of at least 10" of compacted sand and peat moss or potting soil. They should be allowed to dig and maintain a burrow which will help meet their need for a warm, humid retreat. Warmth in the 78° to 82° F range and a humidity of 75 to 85% is best for this burrowing species. Behavior The King Baboon Spiders are very aggressive and best housed singly. With the slightest disturbance they can become defensive. They make a hissing noise by rubbing the hairs on their front legs together, and they will rear up on their hind legs with fangs bared, and bite. Handling This species is very aggressive / defensive and should not be handled under any circumstances. The bite can be medically significant for some people. We suggest using a paint brush or other tool to corral the King Baboon Spider when moving it from enclosure to enclosure for cleaning, maintenance, or for breeding attempts. Reproduction Mature males are smaller than females, are very hairy and slender, and have no tibial hooks to aid in breeding. Unlike most baboon spiders, the King Baboon Spider is very difficult to inspire to breed, even when a healthy well-conditioned adult pair is available. The females are extremely aggressive to any males (and anything else) that come close to their burrow. Adult males should be carefully introduced into the female's enclosure after he has produced a sperm web. The males will be quickly attacked if the female is not interested in mating. He may be quickly eaten unless a keeper can protect him with a piece of cardboard or other tool if he is to be used for further breeding attempts. Once mating occurs, the female should be fed a variety of prey on a more frequent schedule (up to three times a week). When an egg sac is produced, a female will tend to be a good parent and the process moves forward without problems. An egg sac will be produced from a month to eight weeks after mating. The sac, typical for baboon spiders, is suspended in a web hammock and will incubate for five to eight weeks. The babies emerge and molt and will begin spreading throughout the enclosure. When this occurs, they should be separated into individual containers as they will begin cannibalizing each other soon. Young baboon spiders can be easily raised in plastic vials or jars with a deep substrate (1/3 to ½ of the height of the enclosure) and a small clump of sphagnum moss or piece of leaf on top to add some humidity to their environment. The spiderlings feed well and grow rapidly. Availability King Baboon spiderlings are only sporadically available. Captive breeding of this amazing species has proven very difficult. Most spiderlings that become available are from dealers offering spiderlings that have been produced from egg sacs taken from wild-caught females. Spiderlings are hardy but grow slowly. Hopefully the future will see more success in producing this species. Hello! I know there are a few tarantulas that can be housed together, would the king Baboon be one of these? hi I've just obtained a baby baboon, and I'm wondering what you guys think is the best way to provide moisture. I've read two conflicting methods, one source tells me to keep them quite dry (more so than other Ts) and another tells me to keep them above 85% humidity. Whats your input? I find it unbelievable that anyone would have such a creature living in their home! I am a severe arachnaphobic! I can't believe you could be that afraid of something so much smaller and weaker than you. It's not like its a highly venomous spider like a Black Widow or Sydney Funnelweb. Your much more likely to get hurt by a dog or horse. Are you afraid of those too? king baboon is rare species.when you disturbing spider, that keep hissing sound . like a cat. front legs is curved.